What do the Beatles, Daft Punk and Pink Floyd all have in common? They all have a song that is also the name of a board game! I made a Geeklist on boardgamegeek.com that lists song titles that have board game names in them. One of my favourite bands is a Vancouver based band called Mother Mother and they have a song called Train of Thought which is quite excellent! This led me to thinking what other song titles have board game names in them. Here’s the list to see for yourself! Train of Thought Session Report! 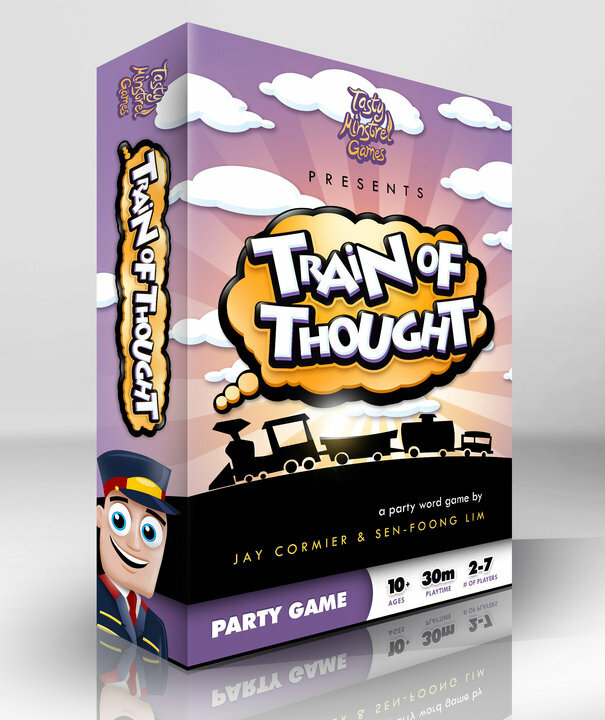 Hey this is cool: Myriad Games recorded a Session Impression of Train of Thought. They did an audio recording of all 6 of them talking about the game and their thoughts about it. It was such a pleasure to listen to because they just seemed to be having so much fun! They all seemed to really enjoy the game – with one of them claiming that Train of Thought is a better game than Ticket to Ride! 🙂 For the non-gamers reading this, Ticket to Ride is a very popular Euro-styled game about trains and making connections – and is not a word/party game at all…so it was kind of meant tongue in cheek! Check out their impressions here. A bit of comedy for you today: a commercial for a fake board game called “It’s Not Jackie Chan.” Now this is hilarious! Click to check it out. Where can you get Train of Thought? Well it’s out there now! Train of Thought is available online and in stores. Yeah but which stores? Well, it’s hard to know all the stores that are carrying it, but they’ll mostly be actual game stores. Don’t go looking in Toys R’ Us or Walmart quite yet! If your local game store doesn’t have it – well, tell them to order some in! 🙂 Hopefully if more and more people are asking for it, then they’ll have to bring it in to keep up with the immense demand. I’ve listed a few sites below of online stores that are carrying it if you want to buy online. 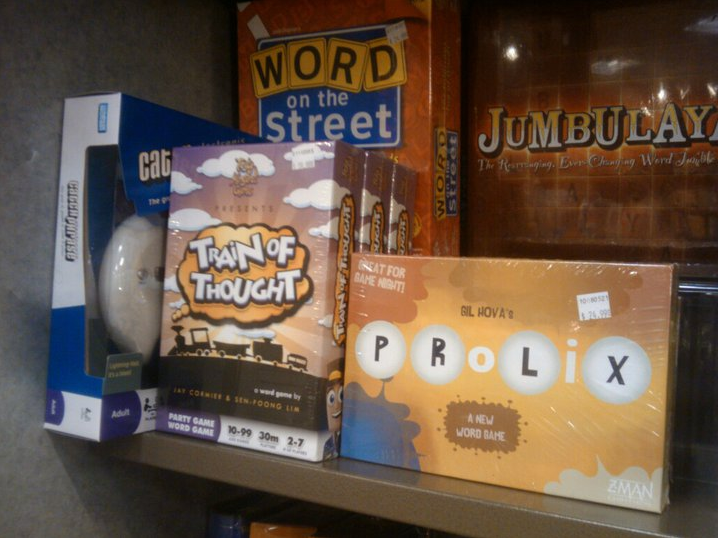 Also – Train of Thought is back on the Hotness List on boardgamegeek.com! When people play any game, they can log into their profile and record that they’ve played it. To get on the Hotness I believe a game has been played by the most people. So Train of Thought is currently the 22nd most played game in the world (according to the users of bgg.com!). Father Geek provided us with a great review earlier this week and now he’s offering a contest to give away some free copies of the game! Head on over to his site to see if you can get a copy for yourself! 1) There’s a ‘bidding war’ between multiple publishers over the rights to publish your game. This would be amazing but usually only happens to designers with a reputation. 2) A publisher agrees to publish your game at the convention. There’s no contract because it’s so impromptu – but it’s usually a verbal agreement that will restrict you from showing the game to any other publisher. 3) A publisher is interested enough to take the game back to their offices to playtest with their playtest groups. Number 3 is the one that will happen most often as a publisher wants to see the ins and outs of the game on their own time. 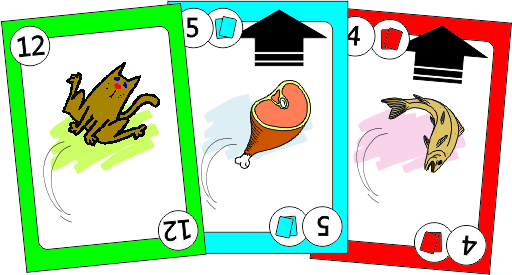 After showing a game to a publisher at a convention and they say they would like to take it back with them, the acceptable thing to say is that since you only have one prototype that you’d like to keep it until the end of the convention. Every publisher I’ve said this to immediately understands this and is 100% fine with it. Who knows, maybe there’s another publisher at the convention who’s willing to agree to publish the game right there at the convention! Max from Out of the Box liked our Games on the Go line of games enough to want to take them back with him. Before I could reply he said that if they were my only copies of the prototype then I could come back at the end of the show to give them to him. Nice. When you do hand off your games, make sure your games are properly labeled. A properly labeled prototype has your name and contact information on as many things as possible: on the outside of the box, on the inside of the box, on the rules and even on any other smaller boxes or baggies. If you have business cards made up, then just glue or tape your business cards to the box. Label the outside of the box with the name of your game. Make it in colour and use an appropriate font. You don’t have to be a graphic designer to come up with an acceptable logo for your game. The publisher fully understands that this is a prototype – but all these extra touches shows how serious you are about it. For Akrotiri we just searched online for a Greek font and came up with dozens to choose from. We made it blue and added a drop shadow behind it – and voila, we’ve got a logo! You have to think about where this box is going. It’s going back to their offices with however many more games they agreed to take a look at – and added to the pile of boxes that they already have there. You need to ensure that your game will stand out from the others. Something that will make one of the playtesters say, “Hey let’s play that one with the leopard print box.” If you just pack it in a boring brown cardboard box and tape it shut – then you’re not doing yourself any favours. So by the end of the convention, it’s time to hand off as many of your games as possible. If you got offers from more than one publisher for the same game then you’re going to have to make some tough decisions. At my first convention we got an offer to look at Jam Slam (back when it was called Jungle Jam) from R&R games as well as Face to Face Games. Since Jungle Jam at the time needed electronic components we decided to show the game to R&R Games since they had experience making games with electronic pieces. In discussing this with Face to Face Games at the end, they understood and weren’t disappointed as they got to take another one of our games back with them at the time. The next few steps will be about working with a publisher who’s agreed to publish your game. First official review of Train of Thought is in! We’ve heard a lot of great things from the community about Train of Thought (like the reviews posted on Train of Thought’s Facebook page), but here is our first official review – and it’s a good one! Father Geek has been reviewing games on boardgamegeek.com for years and he has written up a great review of the game here. Thanks for the review Father Geek! If anyone else has reviewed Train of Thought – please make sure to let us know and we’ll link to it! If you’ve been following this blog for awhile then you probably know most of the story, but in case you haven’t – or you’re interested in learning more about the process we took from …well – from Inspiration to Publication (natch!) – then check out the Designer Diaries that was posted this wkd on BGG.com! If you’re lucky, you’ll at least get feedback from the publisher at the end of the game (and of course, sometimes throughout the game too). Now here comes an absolutely critical point – LISTEN! It doesn’t matter that you already thought of the idea that he just suggested – publishers want to know if you are going to be easy to work with on the further development of the game. This isn’t to say that you have to roll over and accept all their feedback 100%. Listen to their entire feedback and then formulate your response appropriately. When playing Belfort for the first time with Tasty Minstrel Games, they gave a couple of suggestions at the end. One was about determining player order. They had a different idea for how players could change player order throughout the game. I thought it was an interesting idea and then actually wrote a note down while in front of them. This helped to show that I took their feedback seriously. I was fortunate enough that they wanted to play again the following night and I said it would be easy to incorporate their idea in that playtest. We did, and the game played better. I think the ease of working with me made their decision to publish Belfort a bit easier that night. If a publisher is not forthcoming on their feedback, then start them off by asking them the things that they liked the most about the game, then what they liked the least. Even if they never publish the game, this feedback is like gold to you as you now have feedback from a publisher on how to make your game better (at least in their eyes). While you don’t have to change the game based on every piece of feedback you get from a publisher, it’s still wise to listen and keep track of what feedback you’ve received in case you start to see a pattern developing. Remember that they are giving feedback to change the game into something that they would want to publish. Maybe this publisher makes a lot of games for younger kids so they keep trying to simplify the concepts and strategies. Of course, if you did your research beforehand you’d know what a publisher wanted and would show them appropriate games. That said, sometimes it’s getting near the end of the convention and you haven’t had a bite on a couple of your games, so you start branching out to some not-so-perfect fits! Sometimes the feedback you get will be that they’re not interested. If possible, without sounding too much like a doofus, try to find a reason why not. Humility will be very important here. Try not to be defensive! Most likely you’ll get a response that they’re not publishing games with pirates, or card games, or games with high production costs, or games with language on it, or games for that demographic. Whatever their response – it’s great information for the future. One day you might invent a game that does fit with this publisher’s needs. When showing Up in the Air to R&R Games they said that they thought the game was going to be a lot goofier based on the theme of juggling. When they saw it was more of a serious card game, they lost interest. Fair enough. When showing Hog the Remote to Out of the Box Games, Max said that he wasn’t looking to get into any more pop culture games based on the sales of a recent game not performing well. No problem. Bottom line – listen, listen, listen. It’s so easy to become defensive about your baby that you’ve been working on for years. Instead, keep your emotions in check and listen. You might be surprised how it turns out. 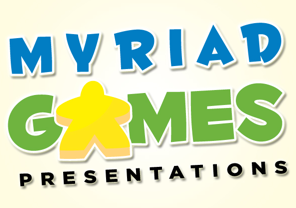 Next up we talk about the last phase of a convention – leaving your game with a publisher. 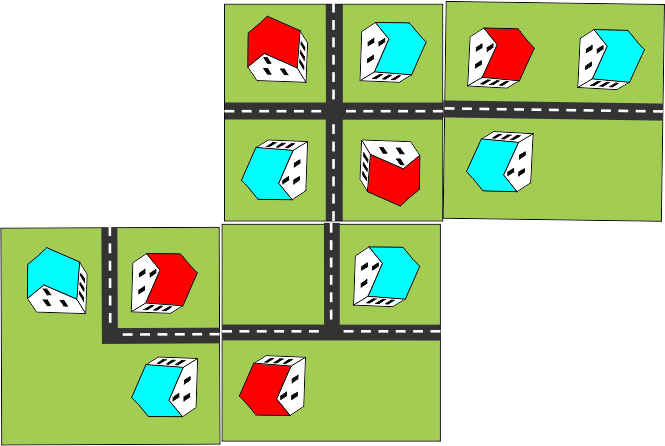 As much as designers want a game to be played, they tend to design games that they themselves would want to play – sometimes subconsciously. More often than not, the end result is a game that, while good, may not have the mass appeal necessary to take the game to market. Taking feedback is a critical skill as it is the best ways to transform a game from something you like into something more people will like. Unfortunately, the designers are usually too close to the project after working on it for so long to be completely objective Being detached about their “baby” becomes difficult and accepting criticism is very difficult, but is, in my opinion, the real definition of being professional. It’s not whether you can design a game, or sell 100,000 copies – it’s whether or not you can receive feedback gracefully and implement suggestions in a constructive and positive manner. There’s a line in a movie or TV show that’s always stuck with me that goes something like “To be interesting, you’ve gotta be interested.” See the difference? I think it had something to do with picking up the ladies in the movie, but what this means in terms for feedback is that you need to show the person giving you the constructive criticism that you are actively involved in the feedback process. When feedback is being given to you live, it is not a passive process and it is not one-sided. Your role as the receiver is to first ask for feedback. And from there, your job is to appear interested in order for the person giving feedback to feel like they are being valued, that they are being listened to. Non-verbal cues such as leaning forward attentively, making good eye contact, and writing down what they’re saying are sometimes more powerful than the verbal cues. Make the person giving the feedback feel like they are the only person in the room and that you are hanging on their every word. Add this to verbal cues like saying “That’s great, please go on!”, “Excellent feedback – let me jot that down!” and you’ve got a recipe for helping people open up to you. Remember though, being a good listener means that they’re doing most of the talking – it’s very difficult to use your ears when your mouth is constantly in motion! Will every piece of feedback be useful? Will every piece of feedback even be constructive? No – some of it is not helpful at all and some of it will just be offhand comments with little to no bearing. 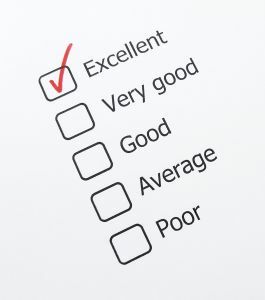 But there is an art to drawing out the kind of feedback you need from your audience. Once you have a publisher engaged in an active feedback session, you want to get every last bit you can from them. Again, there are both verbal and non-verbal cues you can give to elicit more feedback. Simple things like nodding and saying “go on” can help make a person feel like you are willing to continue listening. Asking a person to clarify or expand upon their initial feedback is a great way to keep them talking and to get to what they really mean – more often than not, their initial statement is just scratching the surface of what they want to say. So following up their comment with something like, “That’s interesting – tell me more about how you see that working” can help them help you. The longer you can keep them interested in talking to you, the more memorable you and your game will be to them and the more they will likely feel that they had a hand in helping the game come to fruition. They may even talk themselves into liking the game enough to take the prototype for further consideration. So, much like a hostage negotiator – keep ‘em talking! One question I find very useful is called a “scaling question” – you ask the person to rank some aspect of the game (or the overall game, even) on a scale of 1 to 10, with 1 being poor and 10 being great. Then you ask them how you could make the game even just half a point better (so a 6.5 instead of a 6, for example). This type of solution focused questioning leads to some amazing insights and really helps to involve the publisher in helping you find solutions to their issues with your game. The #1 way to kill a feedback session before it has really started is to be defensive. You want to project a sense of collaboration rather than confrontation. So you need to be objective. You need to separate yourself from the project at this moment and recognize your purpose in asking questions. It’s to gain the knowledge you need to get your game published, first and foremost. Taking feedback sometimes means taking the bad along with the good. You may not particularly agree with what the publisher is telling you. Sometimes, you may have already heard that. But by shutting them down by saying, “Yeah, we’ve heard that before…” or “No, I disagree with what you’re saying” you are effectively closing the door on your own future. And rolling your eyes when a publisher says something like “Hey, have you considered adding a spinner?” is always a bad idea. Be open and willing to accept any and all feedback. This doesn’t mean you have to act on all of it. In fact, a high percentage of it you might have already heard or its the kind of feedback you can disregard as it doesn’t fit your artistic vision. Your goal isn’t to get in an argument with the CEO of Company X over whether your game has any merit or not. Your goal isn’t to defend the current incarnation of your game. Your goal is to find out what the next incarnation of your game would have to look like for Company X to consider publishing it. You may not realize it at first, but the publishers are giving away a gold mine of information when they give you feedback. They are, in effect, telling you what changes would need to be made in order for your game to become more publishable. So, be open and accepting of the feedback you’re given. Some of it may just help you out in the long run. So that’s just a few hints about feedback. One of the fringe benefits of working as a team is that Jay and I are constantly giving each other feedback, and while most of it is positive, sometimes we’re telling each other that we really don’t like where a project is headed or that we’re really not interested in a specific game at this time. That’s sometimes difficult, as we usually champion projects separately and in a duo, there’s no such thing as consensus! Giving and receiving feedback is a difficult thing – it is a skill that takes time to master. But if you can, you will be further ahead for it. As I wrote above, it is the mark of a true professional to be able to take difficult constructive criticism and act on it accordingly. Remember – yes, you are selling your game but you are also selling yourself as someone who can work with a publisher in a rational manner. And being able to give and receive feedback and make positive changes to your game because of it is the best way to show a publisher that you’re in this game to win it.